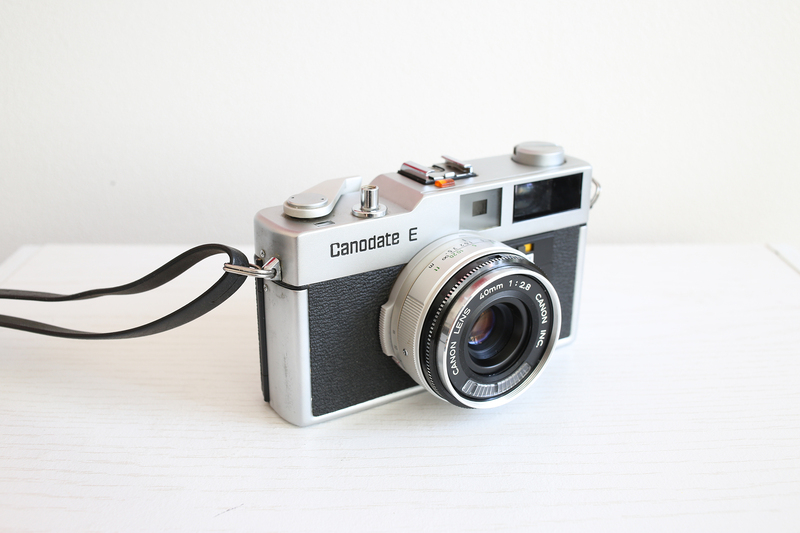 The Canodate E is a rangefinder that first came out in 1970 and sports a 40mm f/2.8 lens with a Cadmium Sulphide (CdS) as opposed a selenium metering system. With a press of a button the Canodate can stamp a date on the photo, which is set manually by the user. This camera is battery-operated, though the shutter button will go down without the shutter actually being released if no battery is inside. From a collector's perspective this camera is unique, in that it is one of the few without a standard "thin-line" or "thick" Canon logo emblazoned on the body. You can differentiate this from the new version that came out about 3 years later by two features: a red "E" badge as opposed to gray, and a shutter lock that would prevent the shutter from depressing if the battery is depleted.